Michel Lethiec (clarinet), Itamar Golan (piano), Artis Quartet (Peter Schuhmayer (violin I), Johannes Meissl (violin II), Herbert Kefer (viola), Othmar Müller (cello). This disc is an opportunity to get to know the magic of klezmer in a classical music framework. It’s a rare chance since most klezmer is used on high days and holidays among Jews. It is also to be found reflecting suffering, nostalgia and sadness; in that sense performing a similar function to the blues or fado. There has been a resurgence of this music since the 1980s by which time it had almost disappeared. For anyone not already acquainted it will come as a surprise because it creates a different sound-world to what is usual in classical music. The great klezmer clarinettist Giora Feidman described klezmer as “an interpretation of art and life based not solely on Jewish folklore, but rather on a cosmopolitan divergence of musical genres”. By this he meant that all kinds of influences fed into the music much of which emanated from Bessarabia (part of Romania), where it absorbed Romanian folk music themes just as it did Bulgarian, Turkish and Hungarian as well as themes from other Central and Eastern European countries. In turn it exerted its influence on the music of those countries. The result is a rich musical soup that whilst immediately recognisable as Jewish also has discernible elements from these other musical cultures. The Argentinean composer Osvaldo Golijov’s family were Jews from Eastern Europe. Throughout his childhood he came under the influence of this rich musical tradition so it is no surprise that he should want to incorporate klezmer in some of his compositions. Taking for inspiration the story of Cabalist rabbi Isaac the Blind (1160-1235), Golijov has written a work that uses klezmer melodies throughout. Divided into five movements it opens with a short prelude that is introduced by the string quartet and which creates a suitably sombre and reflective atmosphere. The clarinet joins in to take the central role and this prelude merges into the second movement marked agitato which it certainly is with the clarinet reproducing a moaning sound. The third movement, based upon an old klezmer song ‘The Old Klezmer Band’ is for dancing. After its introduction in a slow dirge-like mode it breaks out into a faster rhythmic meter. These two contrasting speeds then alternate. Though I’ve tried to discover the answer I am still unsure whether the ‘klezmer clarinet’ is in any way different to a conventional one or whether it is more down to the method of playing. In any event it can in klezmer be hugely successful in creating both intensely sad sounds as well as riotously festive ones. In this composition the sad sounds are sometimes joined by the odd human moan emphasising the black mood. The fourth movement marked calmo is quite hauntingly beautiful and it merges into the postlude that closes the composition. Written in 1924, Ernest Bloch’s three movement Jewish Life for cello and piano opens with Prayer. This sets a suitably serious note with the clarinet taking the place of the cello. The second and third movements entitled Supplication and Jewish Song, are very evocative with sad melodies reflecting long centuries of hardship and persecution. In 1929 Bloch composed the final work on the disc, Abodah for violin and piano. This is an arrangement of a Yom Kippur melody and was given its première by the young Yehudi Menuhin. Working equally well on clarinet it is yet another sad tune. Both these compositions embody the Jewish spirit which has survived despite the odds. 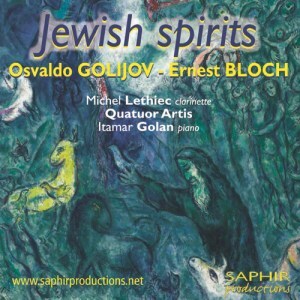 The serious and reflective nature of these compositions is perfectly captured by the clarinettist Michel Lethiec who is extremely well supported by The Artis Quartet and pianist Itamar Golan. This is a very unusual but fascinating disc that will be of interest to klezmer enthusiasts and would serve as an interesting and instructive introduction for those who have not come across it. Once discovered the music is infectious. There are many discs available that contain a good cross-section of not just serious but highly exuberant and exciting klezmer.